I had a toss-up decision with this title, read the ARC or listen to the audio – I chose Audio for my introduction to this series. 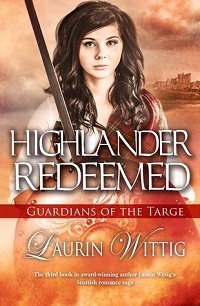 the third title in the Guardians of the Targe series from Laurin Wittig, and brings the series to a close. I love my Scottish-based historical stories: Scotland and her people are as diverse and tough as the landscape, and both set neatly on a deep vein of otherworldliness and tradition. The Highland Targe is a relic stone, said to shield the Scottish heart from invaders. Much like other nods to history, the Targe, for me, felt similar to the Stone of Scone, thought to be a provender of destiny and spent several years below the seat of the Coronation Chair at Westminster Abbey. But, I digress. The Targe has been guarded for centuries by the MacAlpin Clan, and this story is set in the time of Edward I (Longshanks) who, after conquering Wales and bringing it to heel under English rule had set his sights on Scotland. Scotia starts this story as the outcast: Wittig explains that Scotia’s impulsive nature and anger for the English led her on a foolish quest to battle, and the clan is now bearing the brunt of the retaliation. In many ways, I felt badly for her: ostracizing her from the life, petting and companionship is not easy when that is the only life you know. But, her anger, stubbornness and tendency to lash out just made her petulant. Determined to do ‘something’ her goals were no more solidly thought through than fog, but her relentless determination to work on her fighting skills, however badly at first, was commendable. Duncan had a solid position in the clan as a respected warrior and expected to continue in his favored position serving the new chief, Nichola, but as one who always was championing Scotia as a young girl, when her fortunes in the clan fell, so did his. From warrior to babysitter, Duncan enjoys Scotia, even when her brashness overtook her good sense. As the daughter of the last chief and cousin to the current Lady Guardian, her position as a young child was solid. But to be relegated to broken toy, good only for scolding and the most menial tasks, with her downfall, being tasked with finding her, yet again, after she disappeared into the forest is for him, a thankless task. Yet, these two manage to cleave to one another for support, friendship, encouragement, training and eventually love. Duncan is surprised by Scotia’s improvement in handling herself in battle, and her ability to quickly learn and master the new skills he is teaching her. He’s the first to realize that she is bored and undirected: with everyone treating her as a child and expecting little from her, she has yet to find her own purpose or reason to grow. He bargains with her – dedicate herself to learning and training, and he will petition for her inclusion with the warriors tasked to protecting the clan. Scotia’s growth is a hard-fought battle: she desperately wants to ‘do something’ to prove herself to the clan, but she is still chafing against the ill-treatment. Duncan is a bit of a martinet with her training, but each skill she masters, he sees more promise and change in her. Slowly, they stop battling one another and learn to come together to better strengthen their own chances against the naysayers and trouble, and their love and passion starts to grow. From a throw-away girl to the potential of her assuming the guardianship and becoming a useful member TO the clan, rather than a solidly accepted member that has more than atoned for mistakes and mishaps, the path of Scotia is a rocky one. And the clan did not come off very positively in regards to their attitude or treatment of her. But, she is, above all, determined to take her rightful place in the clan and aid in the clan’s business, and Duncan with his stalwart support and love is by her side. Narration for this story is provided by Phil Gigante, my first introduction to his work. I have to say that he quickly moved up the ranks for me, from unknown to near the top of my “read the phonebook list and make it compelling’ list. Scottish accents are solid without becoming hard to understand, slight variations in delivery and emphasis of words give each character a slightly different patois. Women’s voices are pitched slightly higher, with a touch of breathy push for Scotia that doesn’t trip over the edge into caricature. Suspense, frustration, anger and even insecurities are presented with aplomb, never overshadowing the written words, simply enhancing the emotional impact for the listener. Small insets of music are added to the story in places that solidify the sense of place and time, bringing an otherworldliness to the tale. While not a traditional historic romance, the story is solidly character driven and laden with historic elements, action and conflict that will keep you engaged and hanging on every word. The romance is a gradual one: more real for the steady pacing as both Duncan and Scotia learn to see one another’s hearts and know their true desires, as it should be. Laurin Wittig comes from a long line of natural story tellers so it only made sense that she was a voracious reader, and eventually became a story-teller, too. She was indoctrinated into her Scottish heritage at birth when her parents chose her oddly spelled name from a plethora of Scottish family names. At ten, Laurin attended her first American Clan Gregor gathering with her grandparents, and her first ceilidh (kay-lee), a Scottish party, where she danced to the bagpipes with the hereditary chieftain of the clan, Sir Gregor MacGregor. At eleven, she visited Scotland for the first time and it has inhabited her imagination ever since. Laurin’s first published book, The Devil of Kilmartin (published originally by Berkley Publishing), won the National Readers’ Choice Award for short historical romance, and was a finalist for best first book in that contest and in the Holt Medallion. Her books have appeared on the Amazon Kindle Top 100 Bestsellers list, the Amazon Top 100 Historical Romance list, and the AmazonTop 100 Historical Fiction lists.